It's now November 29, 2010. 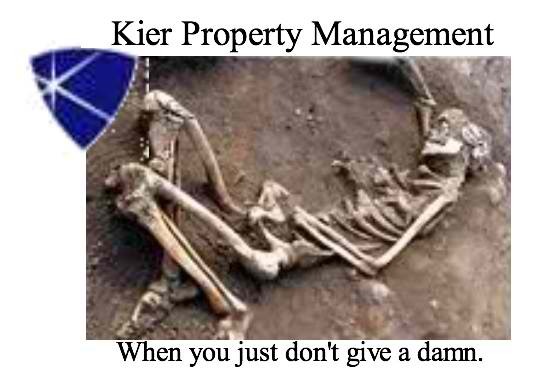 A year has passed since my contract with Kier Property Management terminated and I discovered that Kier had been so horrifically mismanaging and neglecting the residents and my property. It has taken every dime I could get my hands on (and more) over the past 12 months, just to get the building stabilized and running efficiently enough to maintain the building's contract with HUD, in good standing. Sadly, the expense was substantially more than just monetary. In the end, Kier's negligence also cost me my job, the eminent loss of my home, the loss of my cars and nearly everything else I once had. The repairs that were required, just to bring the building up to HUD minimum standards, were so costly, that I can't even afford to hire an attorney to sue Kier and recover some of my losses. Still, not everything at the Peery Apartments is a total disaster. Over the past year, I've learned a lot about integrity, dignity, personal duty and placing others before myself for a change. In taking on the management of the Peery Apartments, my once utopian style universe, that revolved solely around my life in Los Angeles, now takes a back seat to this 100 year old historic landmark building in Ogden, Utah and the 14 families that make their homes there. When I pulled up in front of the Peery Apartments one year ago today, I was in complete shock. Not only because of the severely dilapidated condition of the building, that I once entrusted the care and operation of to Kier, but also because I couldn't quite grasp the total and utter lack of integrity, ethics and moral standards it must have taken Kier over the past 4-years, that enabled them in good conscience, to continue operating this building, while at the same time, permitting it to slide further and further into the state of filth, decay and dilapidation that now stood before me, content in their decision to continue running the building into the ground, rather than tell me they were failing. I was further dumbfounded by Kier's failure in their ability to be honest with me and admit that they apparently lack any of the skill sets required to manage and maintain this property efficiently and appropriately, nor the desire to do so in the first place. I remember as a child, my mother and I had once lived in a low-income housing complex for a short time. Although the management of the complex maintained the property in a significantly better condition than what Kier had maintained my property in, the signs of "subsidized housing" were inescapable. I remember never wanting any of my friends to know that we lived there, because if they found out, they would know we were poor. Walking around the Peery Apartments on November 29, 2009, made me realize how ridiculous that thought process was. Compared to the conditions that Kier had been forcing these residents to live in for the previous 4-years, the complex I lived in as a child, was a palace. When my contract with Kier terminated, my intent was to go to Utah, hire another company to manage the building, transfer management from Kier to the new company and return to Los Angeles within the week, to begin work at my new job. After investigating the options, I decided that Froerer Management would be the best choice and set out to hire them to take over the building. After spending several hours over a 2-day period at the building, Froerer declined to take on the management of the building, based in large part, on its severely dilapidated condition... I was screwed. I returned to the building that day, determined to find out what had gone so horribly wrong, that had left the building in this terrible state. In speaking with each of the residents over the following days and weeks, it became painfully clear that not only had Kier been maintaining the building in a sub-standard condition, they had been doing so all along, telling the residents that they wanted to make the repairs but, "the owner wouldn't let them". I remember being so embarrassed in talking to the residents, that I could barely look any of them in the eye, convinced that they all hated me because of the lies that Kier had told them. Instead, what I found in most of the residents was understanding, compassion and best of all, commitment. None of the residents really believed the lies that Kier had been telling them and the few that did, soon realized they were mistaken. In those first days of going over the numbers and the large amount of debt and unpaid or delinquent bills that Kier had left me with, I just couldn't see how I would be able to make all of the needed repairs and re-repairs of Kier's shoddy work, before the annual HUD-Quality Standards Inspection, looming less than 2-months away. I had practically decided to admit defeat and just let the building go back to the bank, accepting the fact that because of Kier's negligence, I had lost virtually everything I had worked so hard for all of my life. That's when, one by one, the residents started asking me what would happen to them, if I couldn't find another management company to run the building. They all wanted to know if they would lose their apartments and have to move out, and if so, how much time they would have to find another place to live. - Even though the building could have easily qualified to be labeled a, "Slum", The Peery Apartments were still 'home' to these residents and most of them just wanted to stay put. Aside from the system abusers that Kier had placed in the building, was also a contingent of 'long term' residents. In fact, one resident has been living in the building since Kier performed the rehab on it in 1987. She has been a great resource and a wealth of information on how Kier managed and maintained the property. Another resident has lived in the building since 1993. He tells me that Kier never made very many repairs around the building...ever. He also tells me that Kier never charged him a security deposit, in lieu of repairing some unit defects in his apartment... even though Kier's lease clearly shows that he made the required $50 security deposit when he moved into the building, he still insists that he did not. These 'long term' residents and a handful of others, painted a fairly clear picture of Kier's management history, from slow or no response times for serious building emergencies, (like a broken hot water pipe that flooded the building for over 45 minutes before Kier employees showed up to fix it); to gaining tenant compliance through intimidation tactics. (like placing a multitude of threatening warning signs at strategic locations throughout the building) According to the residents, Kier had them so intimidated, that in many cases the residents were literally afraid to file complaints against them, fearing that they would lose their apartments or their housing assistance benefits. By all accounts, from past and present resident statements, as well as the condition of the building on November 29, 2009 and the multitude of illegal or improperly done construction and repairs that have been discovered since that time... The folks at Kier Property Management, were little more than, "Slumlords" who, if nothing else, only contributed to the Urban Decay and disinvestment of Ogden City. Still, throughout this ordeal, my residents and I have kept our eye on just one goal. To get this building turned around and make it a clean, safe and family oriented complex, where tenants no longer live in fear and have a place they are proud to come home to. The following video demonstrates the residents commitment to this goal. The clips were taken throughout the year and combined to create our video New Year's greeting on YouTube. In the end, facing the loss of everything that I have worked so very hard for all of my life, I rest in the knowledge that, (for as long as I'm able to), I have been able to improve the living conditions for my residents, I have tried to right a horrific wrong and if there's ANY justice in the universe, the good folks at Kier Property Management will be spending eternity in a place with a much warmer climate than Ogden, Utah.